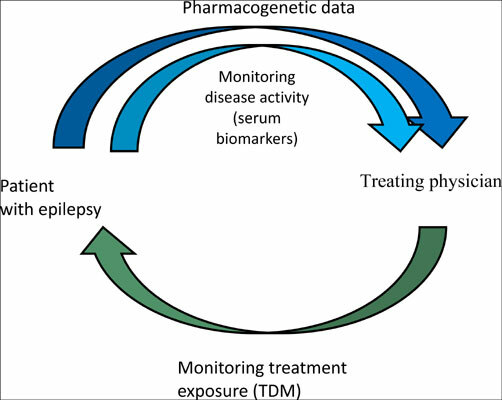 Closed-loop Neuropharmacology for Epilepsy: Distant Dream or Future Reality? Epilepsy is considered the most frequent severe neurological condition but most patients treated with medication become seizure free. The management of treatment, however, is highly empirical, mainly relying on observation. A closed-loop therapy for epilepsy would be very valuable for more efficient treatment regimens. Here we discuss monitoring treatment (therapeutic drug monitoring) and the potential developments in this field, as well as providing a review of potential biomarkers that could be used to monitor the disease activity. Finally, we consider the pharmacogenetic input in epilepsy treatment. Biomarkers in epilepsy, therapeutic drug monitoring, pharmacogenetics, cytokines, genetic factors, refractory epilepsy, hormones.